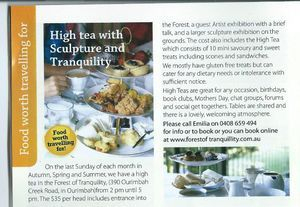 The high tea in set in the rustic grounds of the Forest of Tranquility. Enjoy the sculpture exhibition, music, art and an incredible walk in a rain forest. The cost is $35 per person, couples and groups are welcome, (all tables are shared.) 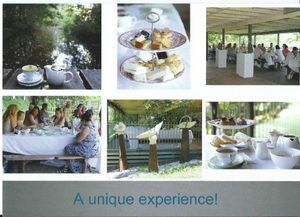 You can book your beautiful high tea here. Gluten or dairy free treats are available on request. The teas will start on September and run on every last Sunday of the month from 2pm until 5pm until Mothers Day in May. Emilia Krumm will be hosting in the main pergola (to the right of the entrance) with a selection of teas and a variety of sweet and savoury treats. There is also the option to peruse the sculptures on exhibition in the immediate vicinity, relax and unwind or take a stroll in the Forest. There is mellow music played by Karen Clarke and a guest Artist. High teas are available for parties of 20 people or more on any other day for book clubs, birthday parties, farewells, conferences and any other occasion. The forest environment is predominantly for the ambulant. If you have any queries or requests, please call Emilia on 0408 659 494.